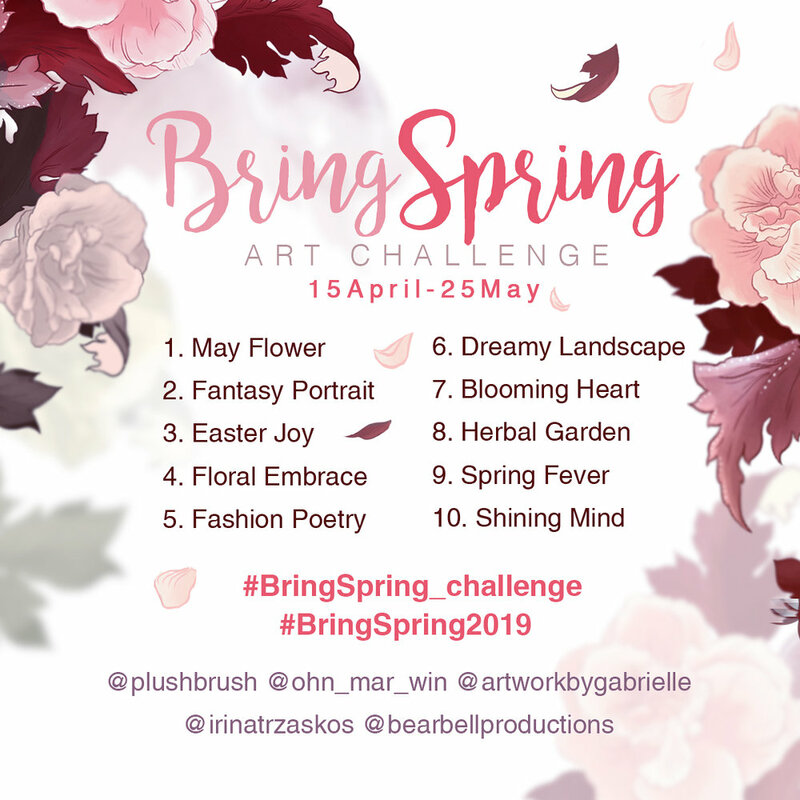 Last year’s BringSpring Challenge became very appreciated and we, the organizers felt very humbled and honered to have so many amazing participants join in and get the creative juices flowing. And hey, did we manage to Bring Spring or what!? The BringSpring Challenge of 2019! This time I’ve teamed up with fantastic Top Teachers Anna Sokolova @plushbrush, Ohn Mar Win @ohn_mar_win, Gabrielle Brickey @artworkbygabrielle and Irina Trzaskos @irinatrzaskos. Each of us have experience with different niches and industries and that - combined with our personal styles and techniques - made us come up with this year’s theme for the challenge - Growth. Spring is about Inspiration and New Beginnings. Regardless of your level, feel free to jump in! We want you to be brave, to dare and try new techniques, tools & new types of motifs! Use this BringSpring Challenge to grow as an artist. Let’s experiment together, plant new ideas which can grow into something completely unexpected and unique! Come along, show us YOUR vision of Spring, we’d love to have you join US. And the most important rule ENJOY the process! Get inspired, brainstorm ideas, create and show us your interpretation of each prompt before May 25th to enter the challenge! One year of Skillshare Premium Membership! - You can do the different prompts whenever you want during the challenge, but in order to be eligible to the challenge prizes you have to do all 10 prompts and post before May 25th. - You can join anytime and use any materials. By the end of the challenge, you’ll have a set of beautiful artworks and not to forget, in great company :). All organizers of the BringSpring Challenge are Top Teachers on Skillshare, and if you want to discover new courses, get inspiration for your challenge prompts, learn new techniques and skills you can check out the classes we teach. Below is a short intro to each teacher. If you’re not a member at Skillshare here is a link that will give you 2 free months so you can try it out, no strings attached. Tip: use the 2 month free trial during the challenge, participate and do all prompts and post before end of May 25th. Then you have a chance to be one of FIVE winners to win a whole year of Skillshare membership! ** This challenge isn’t sponsored, endorsed or administered by, or associated with Instagram.